Joseph Hertgen was a rare bird. Joseph was one of the few Lancaster printers who mastered the art of printing color images by stone lithography. 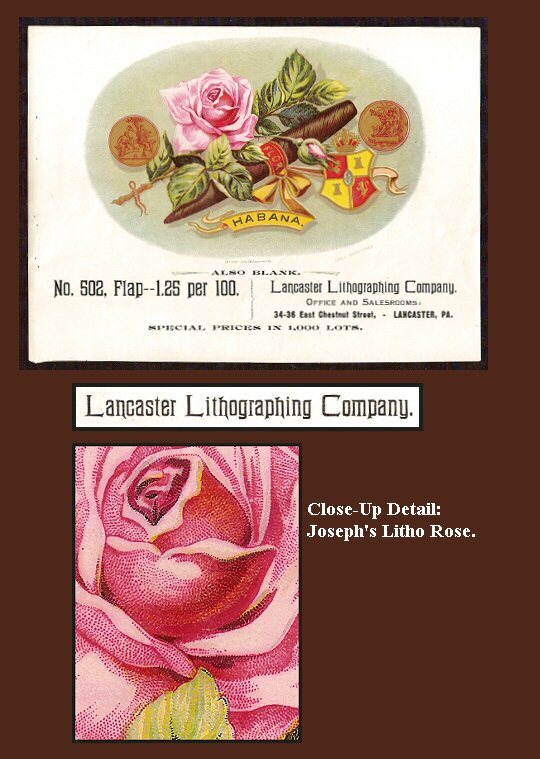 In the 1890s Joseph printed colorful cigar-box labels for Lancaster's cigar makers. 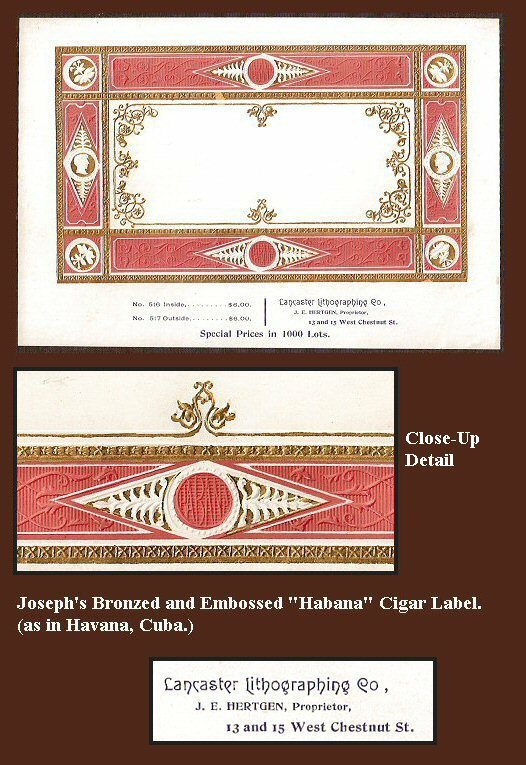 The labels I show here are from Joseph's cigar-label sample book, which he used to advertise his printing business. Above: Joseph printed this cigar box label in the 1890s, during of the "Golden Age of Stone Lithography." 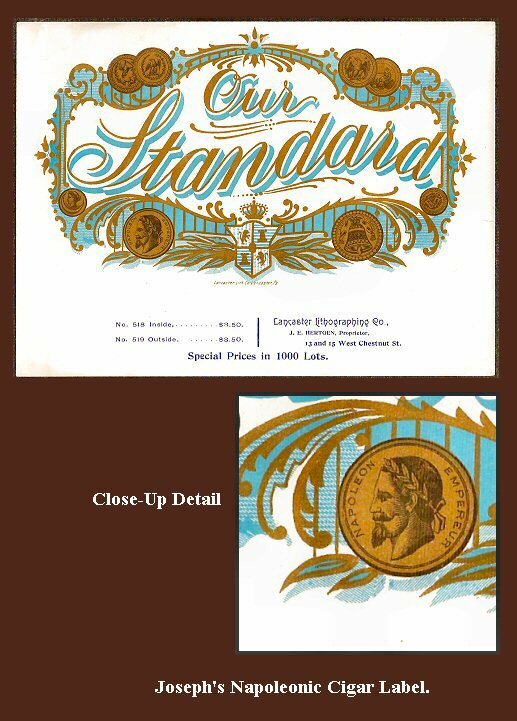 For each color on this cigar label, Joseph had to hand-stipple that color's design onto a heavy slab of Bavarian limestone, which was then pressed against the paper with a lithography press. This red-rose cigar label would have required at least 6 limestone slabs, one for each color. Above: Joseph also printed blank cigar box labels, which could later be printed with the the cigar maker's text. He stamped an embossed design onto this label to create a 3-D effect. He also applied bronze powder to the label, to look like gold leaf. 1829: Joseph's mother, Mary Klingler, is born in "Germany" according to the 1900 U.S. Census. Meanwhile, Joseph's father "B Hertgen" is born in a German-speaking community in Alsace-Lorraine, which today is part of France. Mid 1800s: Joseph's parents emigrate to Boston, Massachusetts, where Joseph's father is employed as an engineer. 1848: Many skilled lithographers flee political unrest in Germany, and turn New York City into a Mecca of chromolithography printing. May 14, 1868: Joseph is born in Boston. Meanwhile Louis Prang, another German-immigrant printer, is turning Boston into another epicenter of American chromolithography. 1871 to 1881: Joseph is a young student. He returns to the Alsace two times, with his parents, to attend school there. He studies in Boston, when he is not in the Alsace. Early 1880s: Joseph moves to New York City, to study lithography. During this time, New York was a leading center of German-American lithography companies: Schumacher and Ettlinger, the Knapp Company, F. Hepenheimer and Company, George Schlegel, Witsch and Schmitt. etc. They were all printing chromolithograph labels for American cigar manufacturers. ca 1898: Joseph moves his lithography business into larger quarters up the street, into the brand-new Davidson Building, which is located at 11-17 West Chestnut Street. The building was designed by Lancaster's premier late-Victorian architect, C Emlen Urban. 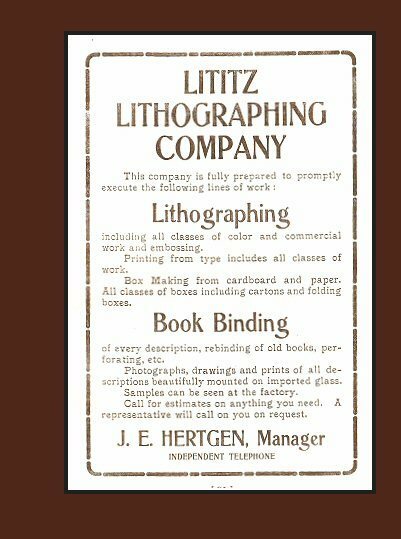 1905: Joseph's "Hertgen Lithographing Company" now relocated to Lititz, and becomes Lititz Lithographing Company. Company officers are: Dr. J. C. Brobst, P. B. Bucher, W. M. Keissling, H. Reist Landis ...and Joseph. 1922: The company expands its business to focus on the manufacture of paper boxes. In 1922 the company soon becomes known as Lititz Paper Box and Printing Company. 1930: The company becomes the Simplex Paper Box Corporation. The company later moves to Hellam, Pennsylvania. Joseph's boxes are gone, but his chromolithograph cigar-box labels survive. Above: In 1905 Joes moved his lithography printing company from Lancaster to Lititz. That same year he purchased this full-page advertisement in the book Historical and Pictorial Lititz. This business was located in a shop on Water Street, near the railroad. This book was published and printed in Lititz by John Zook and his Express Printing Company.